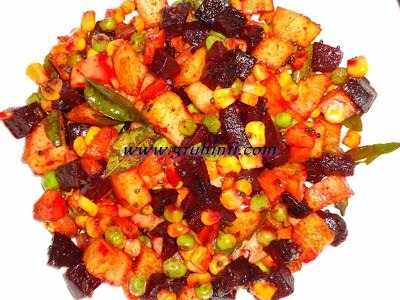 Heat oil in a pan, add mustard seeds cumin seeds and curry leaves, when mustard seeds start crackling add chopped beetroot, carrot and potatoes and cook for a while or untill beetroot pieces become soft, then add salt, green peas and corn kernels. Cook for about 10 minutes, add chilli powder and mix well. Serve hot.